The 2016 Honda Pilot is in stock here at Brilliance Honda of Crystal Lake, and the EX-L is a popular trim level because it offers a variety of important features at an affordable price point. It’s situated between the EX trim level and the luxurious Touring model. Find out what sets the EX-L apart below for your driving needs here in Elgin and Crystal Lake, IL! The 2016 Honda Pilot gets a direct injection 3.5L V6 good for 280 hp and 262 lb-ft of torque in all versions. The EX-L and lower trim levels get a six-speed automatic transmission and front-wheel drive standard. The available all-wheel drive system directs power to front or back wheels, as well as the left or right sides in order to improve handling. It also comes with a traction system with snow, mud, and sand settings. The Pilot EX-L is rated by the EPA at 19 mpg city/27 mpg highway/22 mpg combined with front-wheel drive, and 18 mpg city/26 mpg highway/21 mpg combined* with all-wheel drive. 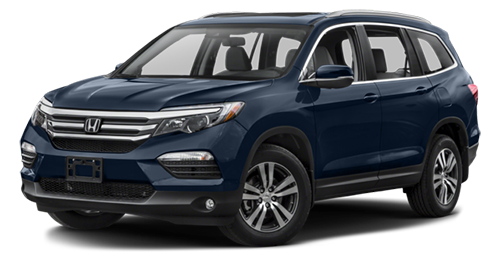 Standard features across the 2016 Honda Pilot lineup include stability and traction control, anti-lock brakes, and front, front side, and side curtain airbags. The EX-L includes dynamic parking guidelines for the standard rearview camera. Drive the 2016 Honda Pilot EX-L along with the rest of the Pilot lineup, here at Brilliance Honda of Crystal Lake, the leading Elgin area Honda dealership. We’re located at 680 W. Terra Cotta Ave. in Crystal Lake, IL, and we have all varieties of the Pilot in stock, so visit us to find the one that works best for you!